The magic of the holiday season transcends time and age. The traditions preserved are elements that excite us, whether we’re 2 or 92. It’s that feeling of joy and nostalgia that hits you when you catch a whiff of spiced gingerbread or hear Bing Crosby sing "White Christmas". Edenton captures this magic like no other. The small town, the historic setting, the dedication to charm and culture, they all converge to produce a host of annual holiday events in November and December, celebrating the season. The community comes together with organizations in town to make the Christmas cheer happen for locals and the thousands of visitors who come to town for the culminating home tour. Chowan County Tourism Development Authority, Destination Downtown Edenton and the Edenton Historical Commission invite you to join them in celebration of this special season. Friday, November 30, lighting at 5:30 p.m., flotilla at 6:30 p.m.
Every town needs its community Christmas tree, and illuminating it is the proper way to kick off the holiday season. Gather with the town members on South Broad Street in downtown Edenton for the annual Christmas Tree Lighting on Friday, November 30. Music from the local children’s choirs singing carols fills the air. The glowing Christmas lights don’t stop with the Christmas tree, though. Watch the flotilla of festively lit boats parade along Edenton Bay, and guess which one will win the grand prize for best decorated. There’s a reason that Christmas carols never go out of style – they’re timeless and catchy. Listen to Christmas melodies fill the air at the Edenton United Methodist Church as the Albemarle Chorale’s Annual Christmas Concert performs your favorite carols. Each year the amateur choir designs their repertoire around a holiday theme. For this year’s theme, Hark and Rejoice!, the selection of carols blends classic with contemporary. Saturday, December 8, 10 a.m. 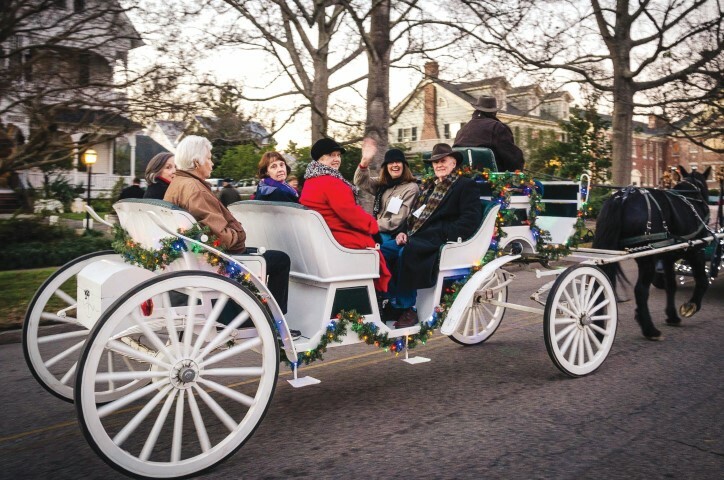 The holiday season officially marches, gallops and floats into Edenton the following weekend at the Edenton Chowan Christmas Parade. Watch the procession as it works its way downtown, and cheer on the decorated floats, boats, cars, horses, marching bands and more as they spread cheer through the town. Could there be a better way than a small town’s parade to usher in the Jolly Ol’ Elf himself? Find Santa spreading season’s greetings downtown following the parade. Friday, December 14, 6 to 7 p.m. If you want more musical merriment, make sure to attend Caroling in the Courthouse featuring the Albemarle Sounds. The all-men’s group brings its quartets together and fills the 1767 Chowan County Courthouse with Christmas carols reimagined in their barbershop style. Stop by during the Christmas Candlelight Tour. Friday and Saturday, December 14 and 15, 1 to 5 p.m.
Use the events coinciding with the Candlelight Tour to make a whole day out of your time in downtown Edenton while also garnering excitement and cheer leading up the tour’s start time at 6 p.m. In keeping with the weekend’s theme of celebrating historic Edenton’s holiday traditions, the events at the Cupola House, James Iredell House, Chowan Arts Council and the Penelope Barker House invite you to take a walk with the Ghost of Christmas Past through downtown Edenton. Start your experience on Friday or Saturday afternoon by enjoying hot wassail and sweets at the Cupola House. Next, get your Christmas cookie fix at the annual James Iredell House Christmas Groaning Board. Curious about the name? Just head to the table laden with cookies – it practically groans under the mountain of sweets! Ready for more? Head on over to the Chowan Arts Council Gallery for Confection Perfection Sweets by the Sound where you can enjoy delicious holiday treats. Continue following your nose to the Penelope Barker House, where their Savories by the Sound fills any final remnants of space in your stomach. The evergreen-laden site’s curators and docents welcome you inside. Admire the decorations, learn about Penelope Barker and the home’s cultural significance while you sip eggnog and snack on hors d’oeuvres. Upon satisfying your appetite and watching the sky turn dusky, you’re ready to begin the Christmas Candlelight Tour. Friday and Saturday, December 14 and 15, 4 to 8 p.m.
An event that has a history of 10 years would be considered successful by most people’s account, but one that’s in its 37th year is reaching legendary status. It’s fair to say that the Christmas Candlelight Tour, held in downtown area and sponsored by the Edenton Historical Commission, has landed in that laudatory position. Always held on the second full weekend in December, the tour features homes in historic downtown Edenton in addition to The Cupola House, The Barker House and the Historic 1767 Chowan County Courthouse. These historic structures are decorated as they would have been several hundred years ago using only natural materials such as fruit, nuts and greenery, helping tour participants imagine this small Southern town almost as if they were time travelers. After checking in at the Penelope Barker House, tour goers fan out into the streets that are normally quiet and fairly non-busy but on this weekend are filled with thousands of visitors, most of whom have driven in specifically for this event, and many of whom are back for their second, tenth or maybe even thirty-seventh visit. Even with a crowd of this size, though, the tour doesn’t feel rushed or crowded. Each year, the tour concentrates on a specific neighborhood, making the self-guided walking aspect easy to negotiate. The families that own the homes on the tour spend months preparing to welcome visitors. Each house is decorated to reflect the personal style and traditions of the family that owns it, which means that some are classic and understated and others are dressed up to the nines. All the houses inspire visitors and, inevitably, leave them with decorating ideas of their own. Imagine, if you will, the experience of meandering through a neighborhood beautifully decorated for the holiday season as the afternoon light begins to fade. The sunlight is replaced by candlelight in each home along with the soft twinkle lights that adorn most of them. Against this backdrop, night falls as you enjoy a couple of hours alongside others who have come to experience Edenton’s special brand of Christmas cheer. 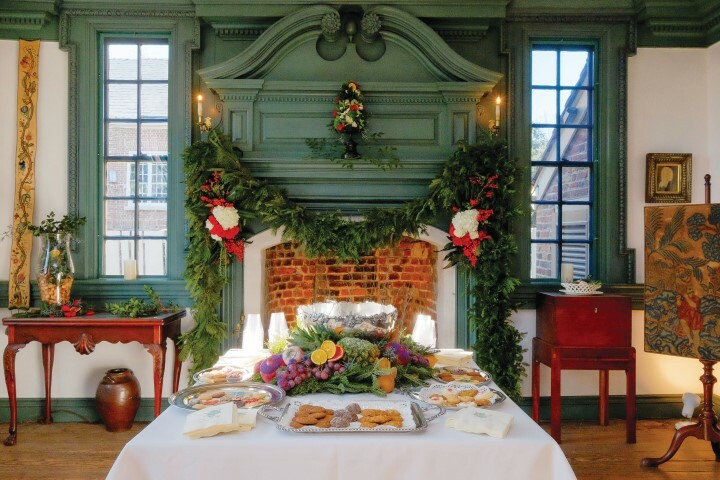 Edenton’s charms are famously enticing during the holiday season, but don’t let that deter you from visiting at any time of the year. 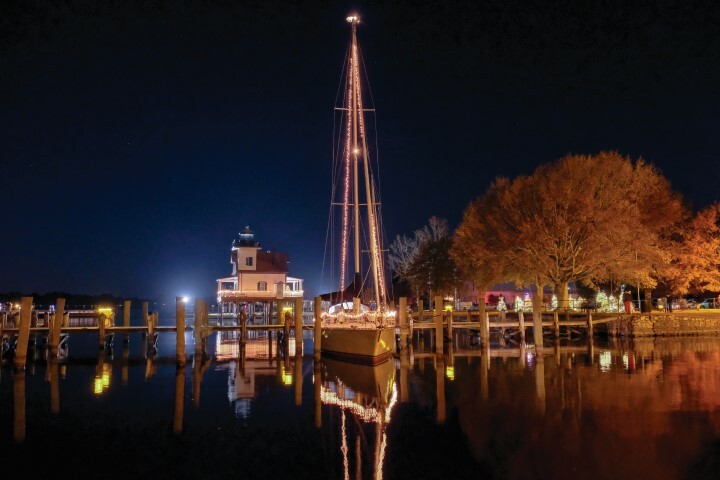 Known as “One of America’s Prettiest Towns,” Edenton shines all year round. 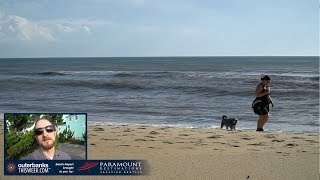 The town offers the full package for daytrippers, overnighters and weekenders, which makes it a popular getaway destination for people from the Outer Banks, Raleigh, Hampton Roads and Richmond. Edenton’s historic sites and beautiful old homes, lovely waterfront setting on the Albemarle Sound, splendid inns and bed and breakfasts in historic homes and thriving downtown full of restaurants and shops make it feel like a very small and compact Charleston or Savannah – without all the crowds. A visit to Edenton should include exploring the town’s rich Colonial-era history. Visitors can tour the Penelope Barker House Welcome Center, the 1758 Cupola House, the 1767 Chowan County Courthouse, the 1866 Roanoke River Lighthouse and many other historic sites by walking tour or trolley tour. Also not to be missed is the downtown area, which offers boutique-style shopping for books, fine clothing, antiques, jewelry, home décor, crafts, gifts, gourmet food and wine and so much more. Restaurants offer options from chef-prepared farm-to-table fare to casual seafood lunches to traditional breakfasts. Recreational opportunities include paddling the waterways, golf and fishing. April 12, 7 to 10 p.m.
April 12 and 13, 10 a.m. to 4 p.m.
Beth Storie first came to the Outer Banks for the summer of 1976. She fell in love with the area and returned for good three years later. She and her husband published the national guidebook series, The Insiders' Guides, for more than 20 years and now are building OneBoat guides into another national brand. After spending time in many dozens of cities around the country, she absolutely believes that her hometown of Manteo is the best place on earth, especially when her two children, six cats and one dog are there too. Locals receive a 5% discount off their purchase.